After an early morning stroll, strong coffee, some bread and fruit, the Harrington's ond other guests at the 'homestay' began part 2 of their 2-day tour option. The day's schedule highlighted an hour or so at the region's largest floating market followed by a visit to a rice noodle factory and rice packaging factory. 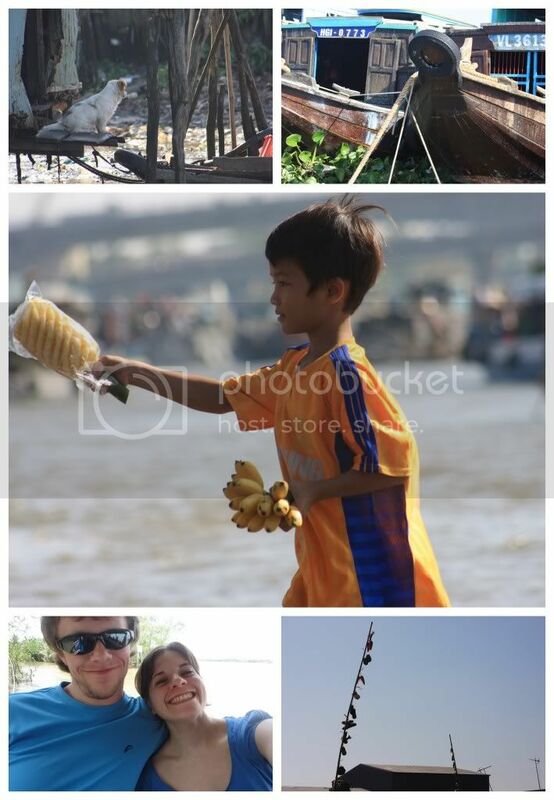 Boats were quickly loaded and after a bit of waiting to be reunited with the portion of the group that opted for hotel accommodation, the Harrington's made it into the floating market which specialized in produce. 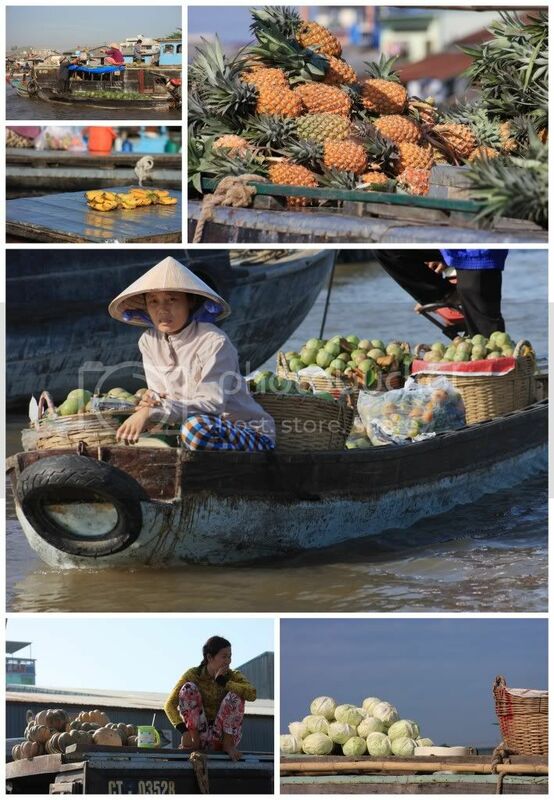 For those looking for a particular fruit or vegetable, all that was required was turning your eye to the sky to see what produce each boat had rigged to a bamboo pole therefore declaring what they had available. The tour guide explained this concept as well as the commitment each of these families makes to spend a majority of their days living on the water, afloat. Quickly tempted to purchase an entire pineapple for less than a dollar, the Harrington duo savored the fresh pineapple which oddly enough had been imported from China (ode to globalization). Having taken in the sights of produce boats as well as the noodle soup selling boats and coffee shop boats, the group was transferred down the river a bit to check out a couple of factories producing some of the areas staple dishes: rice noodles and rice itself. Watching the production of both rice products was fascinating and enlightening as the Harrington's took note of the inherent sustainability. 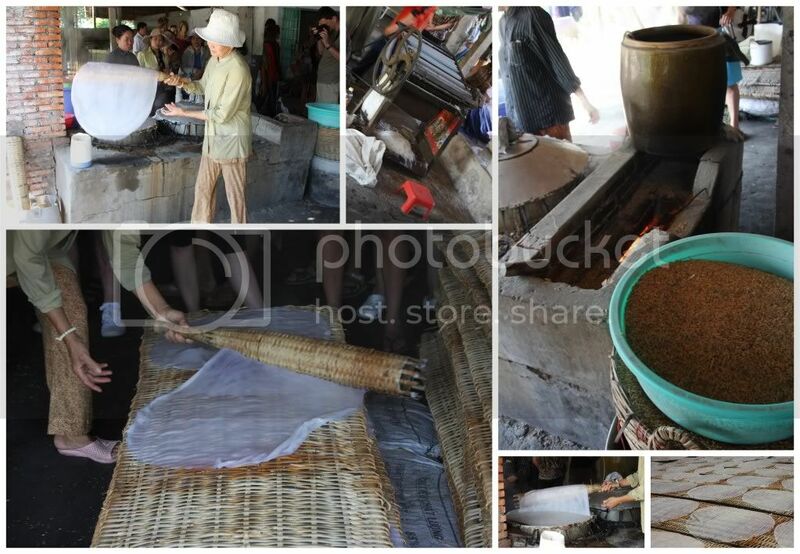 For example, in the process of making rice paper, husks from the rice are used to stoke the fire while the grain itself is boiled down into a milky, soupy mixture, spread out on a steaming board and moved onto a bamboo rack to dry. 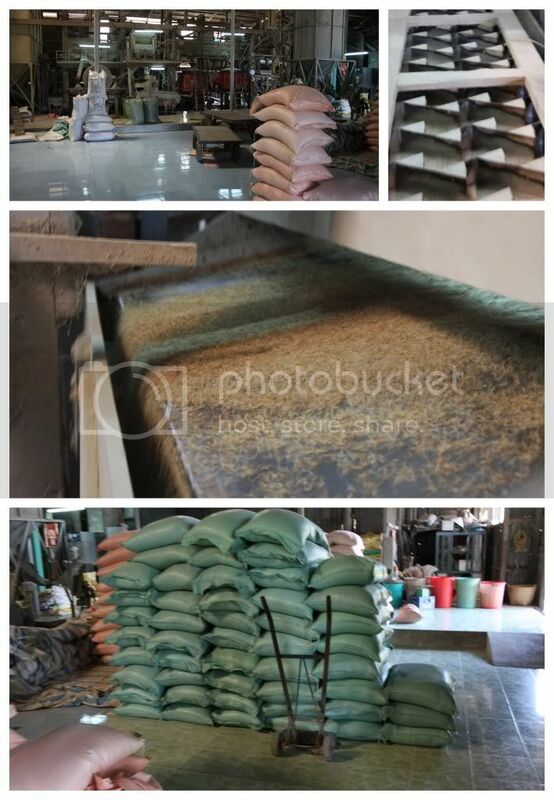 Meanwhile, as the husks burn, ash is the natural outcome which in turn becomes part of the fertilization process to grow the rice and produce the noodles for the next year's crops. Perhaps the farming at a localized level has always been sustainable, and the desire for such now only comes out of a recognition that non-localized farming is inherently unsustainable...but alas, this is not aimed at farming and food production practices. Having finished the promised tours of the day, the Harrington's were taken into the city of Can Tho where they said a few good-byes and separated from the tour group which would soon be returning to Ho Chi Minh City. After grabbing a bowl of Beef Pho and a beer the couple hailed a taxi and made their way to the city bus stop. Upon setting foot down at the bus stop, the couple was quickly deemed worthy to pay the foreigner tax, and paid an extra 1US$ each to board a crowded gray bus to Long Xuyen where they would enjoy a restful afternoon and extraordinary CouchSurfing Hospitality.